Home Prince of Wales Rotary Club Coming to POW? Only With Your Help! 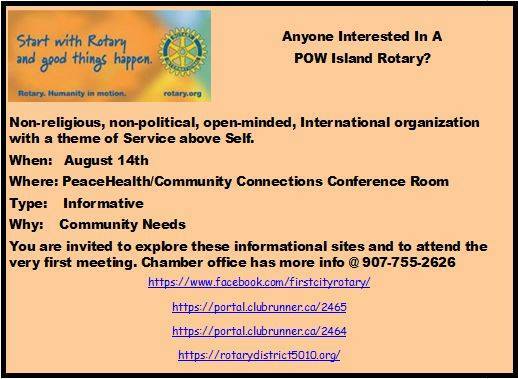 Rotary Club Coming to POW? Only With Your Help! I am a member of First City Rotary Club in Ketchikan, we meet each Thursday at the Cape Fox Hotel at 7:00am. If ever you are in town and interested in breakfast, please drop in and I will be happy to introduce you. 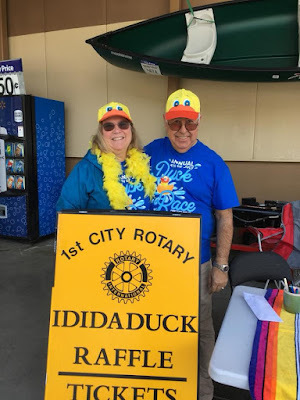 First City Rotary was formed in 1988 from the Ketchikan Rotary 2000 Club. Currently we have about 42 members. We have members in our club that also have connections to POW Island. Bess Clark with Community Connections, Helen Mickel with Tongass Federal Credit Union and myself, and Chris Baca with PeaceHealth. We would like to find POW Island folks that would be interested in joining a satellite club on POW. We hope you might like to be part of starting the first club ever on Prince of Wales Island! Rotary is an open-minded international organization of about 1.5 million members in most every country on earth. It is non-religious or political, with a theme of Service above Self. We do a lot good in our community through various projects including dictionaries for third graders, youth scholarships, steps to Rotary Beach, playground equipment at the senior center, and benches, picnic tables, and garbage cans along the walking path on South Tongass Highway; and so very much more! Would you would be interested in learning more about Rotary? It is a great way to make connections and build community partnerships too. We invite you to explore these sites to become more familiar with the organization. As you review this and other material, what questions do you have that we can address? Please respond to this invitation, if you would like to take part in the organization of the first Rotary Club on Prince of Wales! If you know of others who may be interested, please pass the information along.